My plan of action for the (At)Eleven series of chats with writers has always been to include some element of food. I believe that books and food go together. Food in the pages, food on the pages. So I look for some, even tiny or remote, connection to food with the writer or with the book. In Darcie’s case, I didn’t have to look hard—food is everywhere, connected to everything. We met during a Humber School for Writers mentorship program where much of the chatter was often about food thanks in large part to Darcie, who was then [and still is] working as a food writer, and Susan Toy, who had the rest of us jotting down notes on how best to froth cream or shave chocolate in between discussing the finer points of character development and plot structure. This small group of food/word advocates has stayed in touch over the years and when, this past October, I finally had the pleasure of meeting Darcie in person on a trip to Kelowna, tea, coffee, and sweets were involved. The time was too short. As a group, we have shared in the excitement of her first book, a collection of stories, which has garnered some not insignificant attention. Mennonites Don’t Dance has been shortlisted for the Commonwealth Prize and was a finalist for both Danuta Gleed and the Evergreen Award. The stories focus on mostly rural Mennonite life and the constant tug of war between what is respected and what is desired. Among the trauma, someone is always baking, preserving; kitchens are fragrant despite drops of blood on the tiles. There is life and nourishment among the darkness. I’m grateful and delighted that she has taken the time to answer a few questions—some are even about the book. 1. What literary figure did you relate to as a child? Who did you want to be and why? Velveteen Rabbit. I think I’ve said too much already. 2. How did you come to writing? Do you remember the moment you realized this was what you wanted to do? DFH—I remember writing a story for a fourth grade Language Arts class, and begging my teacher to let me skip recess so I could finish. It’s the first time I remember being specifically delighted and fascinated with what words could do. DFH—I really want to lie here. While I read excellent children’s literature, there’s a black hole between then and when I began to discover authors in university. At 15, I was secretly reading dreadful romance novels and a “Based on the Screenplay” novel of a Julia Roberts movie. 4. Can you share a favourite passage from any book? And if you’d like to say why it’s special, please do. Miriam is who I wanted to be when I grew up. I’m still working on it. DFH—I write almost entirely at my antique (of no known maker) desk that my dad found and cleaned up for me. It’s scratched and banged up and the drawers require routine candle wax rub downs to keep them from squeaking. 6. What has surprised you most about the writing and/or publishing process? DFH—Mennonites Don’t Dance was banned from a library in its early months. That surprised me! That it’s been taken seriously by reviewers and award juries and other writers, though, was, is still, a wonder. I remember coming across the Globe & Mail review (I knew to expect it, but not when, and not what) while in line for coffee. I must have looked like a nutter, standing there, reading, laughing and crying while everyone got their lattes. 7. There’s a tenderness to the stories, understanding mixed with respect, even in the bleakest moments. Makes me think of a cheetah running, beautiful, the grace of a gazelle, then cheetah tears gazelle apart but there’s no guilt or malice on either side. It’s not always pretty but that’s how they survive. The beauty is in the honesty and the violence isn’t gratuitous. In the stories, there’s often a perception of unkindness, but you’ve managed to find the honesty in the actions. A bit of long lead up to the question: which surprises you more, the cruelty inherent in people, or the tenderness inherent in people who appear to be cruel? DFH—Neither. Which, when I look at it, reads like a non-answer and I’m sorry! What surprises me, though, is laughter. That people are most capable of it after being at the centre of such dark stories. 8. One of my favourite stories is ‘Ashes’, in which is the line: “Tomatoes make Anke nervous.” This just so beautifully represents your overall theme, the [Mennonite] fear of [what others see as] basic elements of life. Also Anke and Libby, in this story, exemplify both sides of what feels like the same coin, each wanting a little of what the other has without losing the important parts of self. And yet, what they each lose couldn’t be more personal. Or more universal. Can you talk a little about this story, perhaps as it relates to the others, its history? DFH—Without going into too much detail, I knew someone who miscarried in a bathroom, then went on to serve dinner to invited guests. That was going to be the story. Grief and hospitality. Then Anke wandered onto the page, and tomatoes made her nervous. I had no idea why. It simply became clear that she’d come save Libby from the story I meant to tell. 9. The category of ‘Mennonite Writer’ is interesting in that it doesn’t refer to any specific style and is different [I think] to ‘Mennonite Writing’, which suggests a specificity of topic. So, I wonder then, what does it mean to be a Mennonite Writer? Is it determined by the being Mennonite [regardless of subject matter or perspective] or is the matter of culture within the story essential? How do you see yourself in this context? 10. If you could spend a weekend with one of your characters, who would it be and what would you do? DFH—The grandfather in “Magpie.” We’d sit on the swing and eat roll kuchen and watermelon and spit out the seeds. Brunch or lunch? Brunch. At lunchtime. Mountain or prairie? Mountain. With ocean if it can be arranged. Apple or orange? Apple. No peels. September through November, only. Starch or Salad? Pasta’s a salad! First lines or last lines? My music teacher used to say, “Begin well and end well, and they might forgive a small mistake in the middle.” I really appreciate good beginnings, though. Tent or trailer? Cabin. With climate control and running water. Rain or wind? Both, at the same time!!! Watched from comfort of said cabin. Atwood or Laurence? Pen or paper? Both are needed! 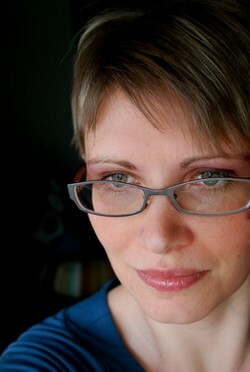 Darcie Friesen Hossack is a graduate of the Humber School for Writers in Ontario, Canada, where she studied under Giller Prize finalist Sandra Birdsell. 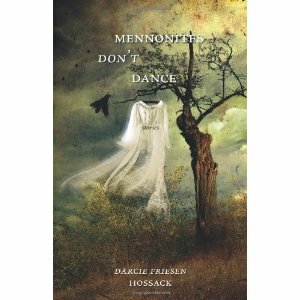 Her first book of short fictions, Mennonites Don’t Dance, was published by Thistledown Press in September 2010. Acclaimed in the Canadian press, shortlisted for the Commonwealth Prize in the First Books Category, the book was also a runner up for the Danuta Gleed Award, and a Globe & Mail Top 5 First Fiction pick in 2011. Darcie grew up in the city of Swift Current, Saskatchewan, though was as much at home on her grandparents’ farm in the Mennonite village of Schoenfeld. She eventually moved to Kelowna, British Columbia and married her high school sweetheart, international award-winning chef, Dean Hossack. Being Mennonite, with its accompanying experiences of farm and food, shaped the author’s faith and love of land (even though she’s never successfully grown anything in dirt), and led to a syndicated food column. Darcie has never had to kill a chicken, though she’s plucked more than a few, and once brought a pig’s snout to school for show and tell.